When crime is committed in Gotham City . . . the court system or chief of police are not usually your best choice of protection. Instead, the people often look to the sky and shine a signal shaped like a bat, and wait for the caped crusader to arrive. Batman is the epitome of civilian vigilante justice. He arrives right on time and rectifies the situation without having to wait on the judicial system. Batman’s character is so appealing, it has been a part of American pop culture for nearly 80 years. At some level, we love the idea of swift justice for crimes committed — and while most of us don’t consider ourselves a vigilante, we are tempted to use certain measures of “street justice” from our emotional utility belts. When we feel like we have been wronged, we are tempted to retaliate by spraying the offending party with passive aggressive repellant, shooting them with destructive words, or trapping them beneath a web of retribution. Often we feel as though these actions will make us feel better . . . but do they? It has been my experience that they do not. After we lash back, the pain remains. So what are we to do? As followers of Christ, we are promised ultimate justice concerning the things that happen in this world. In fact, we are even promised eternal protection (not saying that bad things won’t happen, but ultimately, in Christ our future is secure). But, we do not get these things by punishing those who wrong us ourselves . . . we get it by looking up to the sky and remembering that one day Jesus will shine through those clouds, return to this earth, and set things right. Knowing that is the ultimate climax of justice, we are called to respond to our tormenters today . . . with love. This topic is relevant to all, challenging to all, and liberating to all. 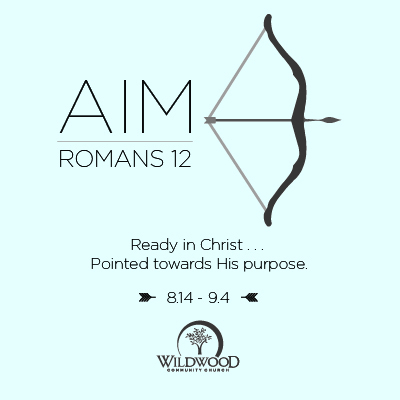 Join us Sunday at Wildwood Community Church as we wrap up our “Aim” sermon series by looking at Romans 12:14-21 together. See you Sunday in our 8:30, 9:45, or 11:00 worship service!